The S&C Research Review comes out on the first day of every month. Here is a preview of the January 2017 edition. It comes out on Sunday. This edition has a special theme of Resisted Sprinting! Resisted sprinting training is a relatively new method of training for improving sprinting speed involving sprint running with additional resistance. Resistance can be either vertically directed (for example, using a weighted vest) or horizontally directed (for example, using elastic bands or towing a weighted sled). The most commonly-investigated form of resisted sprint training is the weighted sled, which has been explored in many acute and chronic trials, although other types of resistance have also been assessed, such as parachutes, pulley systems, elastic resistance bands, and weighted belts or vests. Can very heavy sled towing improve sprinting performance more than unresisted sprinting? The study: Very-Heavy Sled Training for Improving Horizontal Force Output in Soccer Players. Morin, J. B., Petrakos, G., Jimenez-Reyes, P., Brown, S. R., Samozino, P., & Cross, M. R. (2016). International Journal of Sports Physiology and Performance, 1-13. The researchers investigated whether resisted sprint running using a weighted sled with a very heavy load would lead to increased sprinting performance and increased horizontal ground reaction force (and related mechanical variables) in male amateur soccer players. The athletes were randomly allocated into either a very heavy sled training group (VHS) or an unresisted control group (CON). All subjects trained 2 times per week for 8 weeks. CON performed 2 blocks of 5 sets of 20m unresisted sprints, with 2 minutes of rest between sprints, and 5 minutes of rest between blocks. VHS performed the same protocol but including some resisted sprints, towing a sled loaded with 80% of bodyweight. The number of the sprints that were resisted increased over the course of the program, from 5 – 8 out of 10 total sprints. Using magnitude-based inferences, sprint running times at 5m improved by more in the VHS group than in CON (moderate vs. small ES), as well as at 20m (small vs. trivial ES). The changes in mechanical variables were unclear or trivial in CON. In VHS, HF-MAX increased (moderate ES), RATIO-F increased (moderate ES), and DRF became more negative (moderate ES). The researchers concluded that (1) very heavy sled towing improves sprint running ability in amateur soccer players, (2) the improvement is likely greater than the change after unresisted sprinting training, and (3) the increases in sprinting ability after very heavy sled towing were accompanied by increases in HF-MAX and RATIO-F, indicating an increased ability to produce force in the horizontal direction. 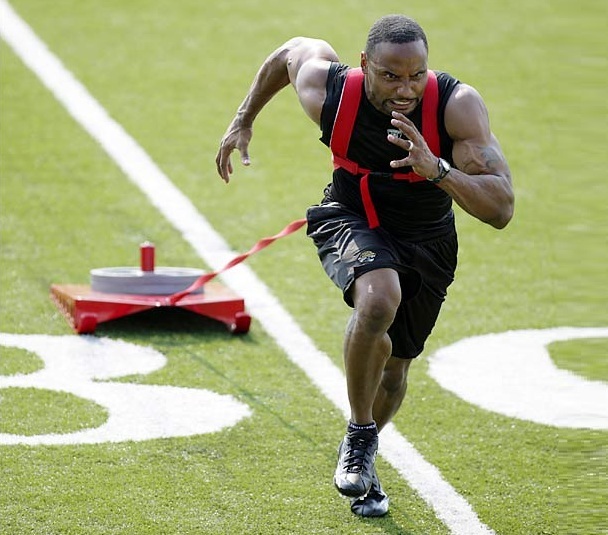 Can weighted vest sprinting improve sprinting performance more than unresisted sprinting? The study: Effects of Sprint Training With and Without Weighted Vest on Speed and Repeated Sprint Ability in Male Soccer Players. Rey, E., Padrón-Cabo, A., & Fernández-Penedo, D. (2016). The Journal of Strength & Conditioning Research. The researchers compared the effects of resisted sprint training with weighted vests and unresisted sprint running training on changes in jumping, sprinting, and repeated sprinting ability (RSA) in amateur male soccer players. RSA measurements included average sprint time (AT), fastest sprint time (FT), total sprint time (TT), as well as the percentage increase in sprint times as a measure of fatigue. The athletes were randomly assigned to either a group who did resisted sprint training using a weighted vest (VEST) or a group who trained using unresisted sprinting (CON). All subject trained 2 times a week for 6 weeks, with a very similar program involving 1 – 4 sets of 3 – 7 reps of 20m sprints with 2 minutes of rest between reps and 5 minutes of rest between sets. 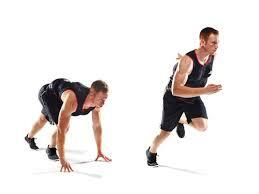 VEST performed all sprints with an additional weight of 18.9% ± 2.1% of body mass. Both VEST and CON improved 10m sprint times and 30m sprint times by a similar amount, but neither group improved vertical jump height. RSA as measured by AT, FT, and TT improved similarly in both VEST and CON groups (7.3 – 7.5% vs. 8.3 – 9.3%). Although neither group improved the percentage increase in sprint times during the RSA, there was a trend for the improvement to be greater in CON than in VEST (3.3% vs. 0.4%). The researchers therefore concluded that sprint running training using a weighted vest was not superior to a similar but unresisted sprint running training program for either sprinting or RSA. The post January Research Preview: Resisted Sprinting Edition appeared first on Bret Contreras.